5 Steps to be There! Hajj is an annual Islamic pilgrimage to Mecca, the holiest city for Muslims, and a mandatory religious duty for Muslims that must be carried out at least once in their lifetime by all adult Muslims who are physically and financially capable of undertaking the journey and can support their family during their absence. It is one of the five pillars of Islam, alongside Shahadah (the testimony of faith), Salat (prayer), Zakat (support of the needy), and Sawm (fasting the month of Ramadan). 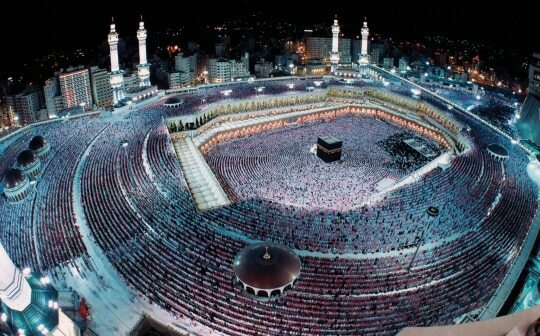 The Hajj is the largest annual gathering of people in the world. The state of being physically and financially capable of performing the Hajj is called istita’ah, and a Muslim who fulfills this condition is called a mustati. The Hajj is a demonstration of the solidarity of the Muslim people, and their submission to God (Allah). The word Hajj means “to intend a journey”, which connotes both the outward act of a journey and the inward act of intentions. While following a route the Prophet Muhammad once walked, the rites of Hajj are believed to ultimately trace the footsteps of the prophets Ibrahim and Ismail, or Abraham and Ishmael as they are named in the Bible. Muslims believe Ibrahim’s faith was tested when God commanded him to sacrifice his only son Ismail. Ibrahim was prepared to submit to the command, but then God stayed his hand, sparing his son. In the Christian and Jewish version of the story, Abraham is ordered to kill his other son, Isaac. Pilgrims also trace the path of Ibrahim’s wife, Hagar, who Muslims believe ran between two hills seven times searching for water for her dying son. Tradition holds that God then brought forth a spring that runs to this day. That spring, known as the sacred well of Zamzam, is believed to possess healing powers and pilgrims often return from the Hajj with bottles of its water as gifts. And its rites were established by Muhammad, but Muslim tradition dates it back to Adam and Abraham, who were instructed by angels in the performance of the rites. The Hajj was one of the last public acts of worship performed by Muhammad before his death. In part, the Hajj commemorates the stories of Abraham, Hagar, and Ishmael and it has been assigned various other meanings throughout the centuries. For many Muslims, one of the most meaningful aspects of the pilgrimage is the unifying effect of bringing together believers from all over the world to meet and worship together. Upon arrival at the boundary of Mecca, pilgrims enter the state of ihram (purity) in which they will remain throughout the Hajj. Males entering this pure state don the ihram garments – two white, seamless sheets wrapped around the body – and sandals. This aspect of the rite not only signifies the state of holiness the pilgrims have entered, but it serves to contribute to a sense of equality and unity by removing visual indicators of class, wealth, and culture. Requirements for women are less stringent, but they usually keep only faces and hands uncovered. While in the state of ihram, pilgrims must not cut their nails or hair, engage in sexual relations, argue, fight or hunt. When he or she enters the city of Mecca, the pilgrim first walks around the Ka’ba (the building at the center of Islam’s most sacred mosque in Mecca) seven times (the tawaf, or circumambulation) while reciting the talbiya (a Muslim prayer invoked by the pilgrims as a conviction that they intend to perform the Hajj only for the glory of Allah), then kisses or touches the Black Stone in the Ka’ba, prays twice towards the Station of Abraham and the Ka’ba and runs seven times between the small mountains of Safa and Marwa. The second stage of the Hajj takes place between the 8th and 12th day of the lunar calendar month of Dhu al-Hijja, beginning with a sermon (Khutba) at the mosque on the 7th day. On the eighth day and night, the pilgrim stays at Mina or Arafat (small cities near Mecca). 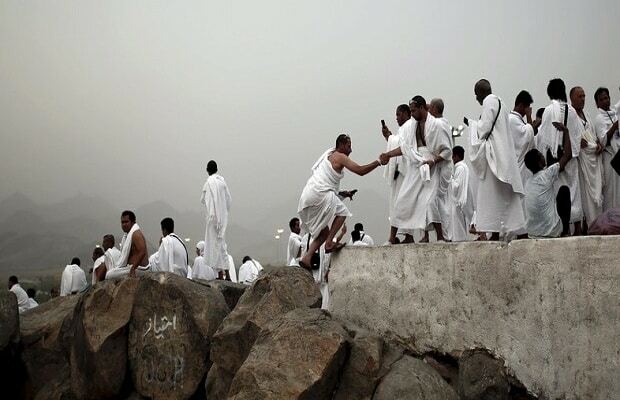 On the ninth day, the ritual of Wuquf (standing) takes place on the small hill of Jabal al-Rahma in Arafat. The pilgrim then returns to Muzdalifa, which is a small town within the Meccan boundaries, to stay the night. The tenth day is Eid al-Adha (The Feast of Sacrifice), a major holiday observed by all Muslims. For those participating in the Hajj, the day is spent in Mina, where the pilgrim sacrifices an animal to commemorate Abraham’s sacrifice and throws seven small stones at each of three pillars on three consecutive days (the pillars represent sins and devils). The pilgrim then returns to Mecca, where he or she once again performs the tawaf (circumambulation of the Ka’ba). The head is then shaved (for the male pilgrims) or the hair is trimmed, which marks the end of the state of ihram. Islamic tradition holds that the Kaaba was built by Ibrahim and Ismail as a house of monotheistic worship thousands of years ago. Over the years, the Kaaba was reconstructed and attracted different kinds of pilgrims, including early Christians who once lived in the Arabian Peninsula. In pre-Islamic times, the Kaaba was used to house pagan idols worshipped by local tribes. Muslims do not worship the Kaaba, but it is Islam’s most sacred site because it represents the metaphorical house of God and the oneness of God in Islam. Observant Muslims around the world face toward the Kaaba during the five daily prayers. To conclude, The Hajj is an Islamic pilgrimage to Mecca and the largest gathering of Muslim people in the world every year. It is one of the five pillars of Islam, and a religious duty which is carried out by every able-bodied Muslim who can afford to do so at least once in his or her lifetime. The Hajj is a demonstration of the solidarity of the Muslim people, and their submission to Allah. Movie Tells… Reality Shocks: Who Is The Real Zombi? 40 Facts About Muhammad You’ve Never Known! Ahlan is a non-profit foundation that aims to clear misconceptions by spreading knowledge. Ahlan was founded in Cairo, Egypt in 2011 and has developed and grown ever since to include different activities that serve our main inspiration. "My choice of Muhammad to lead the list of the world's most influential persons may surprise some readers and may be questioned by others, but he was the only man in history who was supremely successful on both the religious and secular level." [The 100: A Ranking Of The Most Influential Persons In History, New York, 1978, p. 33] Michael H. Hart (1932- ) Professor of astronomy, physics and the history of science.